Becca is a senior at NHS and is highly involved in many different programs and organizations at the school. Becca is a key figure on our golf team and is our lone senior player. She demonstrates high levels of character and leadership for our group. Becca has an outstanding academic record. She is the definition of what a student/-athlete should be; the student comes before the athlete and Becca understands that completely. 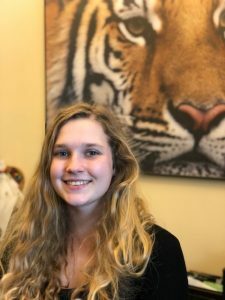 She is an excellent role model for others, demonstrating that you can have high academic achievement and still be involved in everything that NHS has to offer. The Tiger Boys Relay Team put on an impressive display at the OSAA State Championship Swim Meet, leading the way to a 3rd Place Team finish. 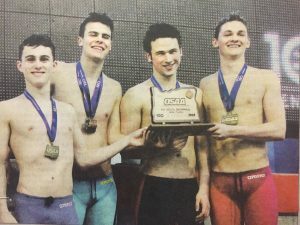 In the 200M Freestyle Relay, the four won a state championship while setting a new Newberg High School record and a new 6A OSAA State Meet record. The relay team also finished 2nd in the 400M Freestyle Relay, setting a new Newberg High School record in that event.